For the first time in 60 years, WSLM aired LIVE COVERAGE of the 2013 NFL Draft. The show centered around the Indianapolis Colts and their pick throughout the four hour broadcast. The Indianapolis Colts spent last year’s draft loading up on offensive talent, so there was little surprise that they would address a defensive need in the first-round. When the Colts were on the clock with the No. 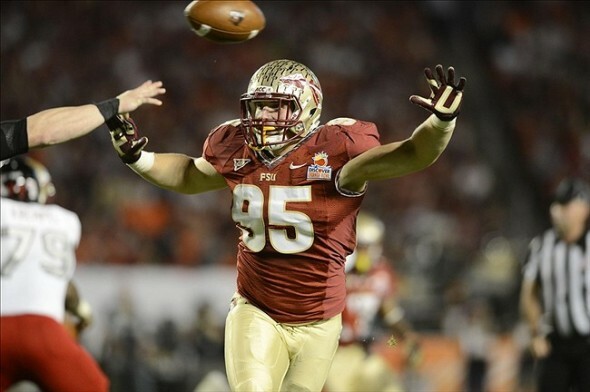 24 pick, they selected Florida State defensive end Bjoern Werner, who was at one time a projected top ten selection. He will play outside linebacker in the Colts 3-4 scheme. Werner is a hard-working kick that never shuts off his motor. While he is not elite in any one category, he is an all-around solid player and was one of the most consistent pass rushers in college football just a season ago. It will be interesting to see if he turns up his intensity and level of play in the NFL, but with his work ethic I would never count him out. The draft is always a treat for NFL fans, so be sure that you tune in and see who the newest players to rock your favorite teams uniforms will be, and stay tuned to FanSided.com throughout the draft for the latest news, rumors and analysis of every pick.